ADB was originally founded in Belgium in 1920 by Adrien De Backer and it operated as a family owned business until 1987, when it was acquired by the SIEMENS Group. 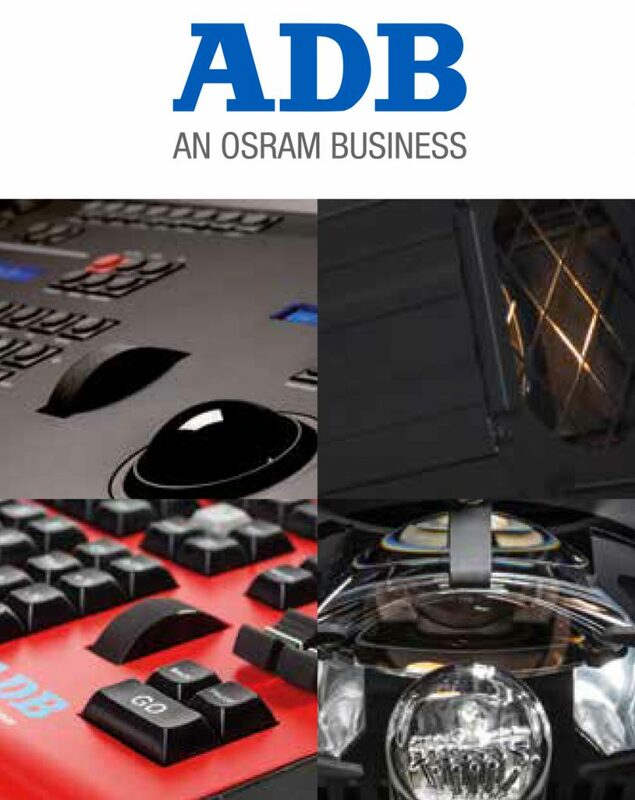 At that time ADB had already pioneered some of the key technologies used in stage & studio lighting, such as digital dimmers, memory control systems, condenser optics for theatre spotlights and it was strongly established as a leading manufacturer with a capillary sales organization consisting of subsidiaries and independent distributors. In 2002, the whole ADB-TTV Group was taken over by a group of private and institutional investers, headed by Christian Léonard, then General Manager of ADB-TTV France. In August 2016, selected company’s assets and activities have been acquired by Clay Paky SpA, the Italian manufacturer of automated luminaires that is part of the OSRAM group. Today production and logistics are located in the French facility in Saint-Quentin, whereas R&D, Product Engineering, Marketing and International Sales have been merged with those of Clay Paky in Italy. ADB’s core competence is in high performance, high quality products and services for professional applications in stage and studio lighting. ADB is mastering software and hardware development, as well as product engineering and production of all key components of a stage or studio lighting system, i.e. luminaires, dimmers, control desks, networks and motorized suspensions. Having become part of Clay Paky, ADB can benefit of its unique experience in automated luminaires and electronics, which results in a broader range of products, including multifunctional and motorized luminaires. For the end user, this is the guarantee of system wide compatibility of all components, easier maintenance, plus the comfort of dealing with only one responsible partner. From system design through equipment specifications, installation and commissioning, the ADB/Clay Paky Project Team provides customized solutions for any kind of stage or studio lighting system. ADB Project Engineers ensure efficient coordination with Consultants and Architects as well as specialists in infrastructures, air conditioning, stage machinery, sound, electricity so as to guarantee to the end user timely project completion and total system performance. ADB & Clay Paky do not compromise on quality, safety and reliability of its products. All products quality is certified by officially recognized third parties. ADB operates through its branch office in France and in Italy and a network of professional agents and distributors in the rest of the world.